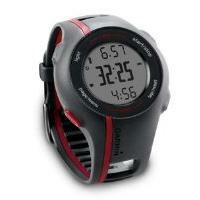 The Garmin Forerunner 210 heart rate monitor is GPS enabled. 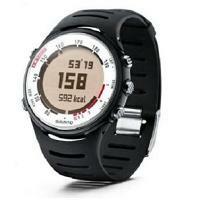 It is primarily intended as a runner's watch with heart rate monitoring feature. It is the next model after Forerunner 110 and provides several additional features above those of the preceding 110 model. The main ones are instant pace, interval training and the capability to use a foot pod (for indoor use when direct access to GPS signal is not possible). High sensitivity GPS receiver using the HotFix satellite prediction system. So it locks onto satellite very quickly. The calorie counter is heart-rate based: hence it is much more accurate. Auto Lap: laps are marked automatically triggered by distance. Interval Workouts with repetitions can be created based on distance or time. You can also add an open-ended warm up or an open-ended cool down to the workout. After each session, the running data can be saved. Up to 180 hours of history can be saved. For each saved run history, you can review: date, time of day, distance, run time, calories, average pace or speed and average heart rate data. It uses rechargeable battery for the wrist watch unit and comes with its own special charger. If you run 45 minutes a day with the GPS, each charge can last about 1 week. The ANT+ chest strap uses a CR2032 user-replaceable battery. Use the Garmin Connect online software or the Garmin Training Center desktop software to analyze or store your training data. Foot pod (optional): The ANT+ foot pod can be used if you are running on an indoor track or on an indoor treadmill when GPS signal is not available. The main differences between Garmin Forerunner 210 and Forerunner 110 are highlighted in bold in the list above. Just like the Forerunner 110, the Garmin Forerunner 210 is very simple to operate. You simply charge the battery (if it is not charged), locate the satellite signals, press the start button and run! You need to create your profile if you use it for the first time, but it is very easy to do. For those who do not like complicated operations, this model is perfect. Furthermore, the large 180 hours of memory means you can review many past runs, and see how you did. The computer upload feature allows even more detailed analysis, plus you can see the route that you travelled on a map. 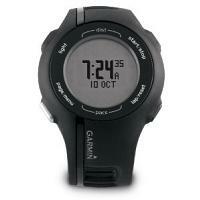 The Garmin Forerunner 210 addresses several shortcomings of the previous 110 model. The Forerunner 210 now allows you to set heart rate training zones and alerts to help you train at the right intensity. It can now also display current (i.e. instant) pace/speed as opposed to just average pace/speed. So now you get a better idea what pace you are really doing when you are running. This model also adds two main additional features, interval workout and the capability to pair with an optional foot pod. The interval workout adds a new way to conduct your training. You can specify the length or duration of the work interval and of the rest interval, plus the number of times you want to repeat them. The optional foot pod can come in handy when you are running indoor, or whenever satellite signals are weak or otherwise lost. 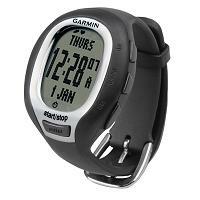 The Garmin Forerunner 210 is a simple-to-use GPS-enabled runner's watch with heart rate monitoring feature. It is based on Forerunner 110 model and its strength lies in its ease-of-use and its elegant modern design. 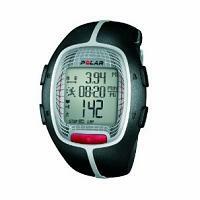 Just like the Forerunner 110 it measures distance and pace/speed. In addtion you can now set heart rate training alerts, view instant pace (or speed), do interval workouts or even use with a foot pod indoor. Garmin has certainly added a fair amount of capabilities to the Forerunner 210 model without compromising on its ease of use. 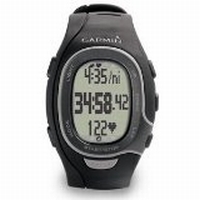 Note that the Garmin Forerunner 210 are supplied in different packages. There is one package that contains just the wrist-watch unit, and one package that contains the wrist watch unit, chest strap and foot pod. The next model up is the Garmin Forerunner 305.